Also notable: the window is open! I don't expect the cool air to last long but boy, are we enjoying it. 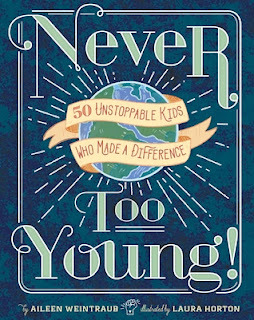 Never Too Young: 50 Unstoppable Kids Who Made a Difference by Aileen Weintraub is a book of mini-bios of kids who either showed brilliance at a skill or went above and beyond to make life better for people while still young. Some of them still are not all that old, some are stories of historical characters who have come and gone. Bobby Fischer, who became obsessed with chess at the age of 6 and became the youngest US Junior Chess Champion ever at the age of 13. Although they're familiar to the adults in the room, some of those names may not be known to youngsters and I didn't know a few of them were child prodigies. I merely knew them as successful adults. Katie Stagliano - who donated a 40-pound cabbage to a soup kitchen and came up with the idea to plant gardens across the country and donate the harvests to the feeding of hungry people. Highly recommended - Great for school libraries and any youngster who likes to read inspiring stories about children who have done big things, Never Too Young would also make a great reference for classrooms to use as a starting point for class projects or reports. In Hot Winter Nights by Jill Shalvis, Molly and Lucas work together at a security firm. When he wakes up in bed with Molly, Lucas is a little freaked out. He remembers feeling compelled to take a single drink, the night before, and then . . . nothing. What happened with Molly, last night? Molly is behaving more than a little bit shifty. Lucas has recently been shot, hence the blackout. Even a single drink with his painkillers was too much. 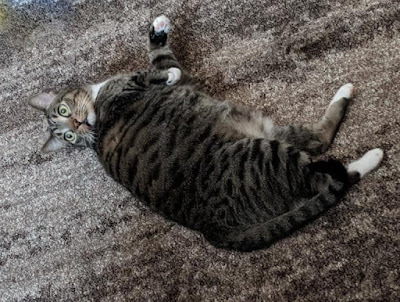 But, Molly is not saying what happened. Bored with being off work, Lucas insists on returning without clearance from his doctor. Molly is the office manager but she wants to get involved in the investigation side of the firm. To that end, she's brought up a case to her boss. Some elderly women who work as elves at a local Christmas Village are concerned that Santa is not sharing the profits as he usually does. They think he's being greedy and keeping their bonus money. Molly's boss, Archer, says they're overbooked and that's not their kind of case, anyway. But, Molly is determined. To keep her safe, Archer asks Lucas to keep an eye on her. He'll have to pretend to work with her. But, before he gets around to offering to help, Molly asks for his assistance. Now that Lucas thinks he's slept with Molly, he realizes just how much he's attracted to her. Molly feels the same but she has secrets and works hard to keep them close. But, now that the wall between them has been broken down, will they be able to stay away from each other? What will happen when Molly goes undercover as an elf and discovers that Santa's story is a lot more dangerous than she could have imagined? Hot Winter Nights is a romance, so you know the answer to that first question about whether or not they'll be able to keep their hands off each other is a flat "No." But, neither one of them is the type to commit. Molly has been hurt in the past and Lucas has suffered two shocking losses that have convinced him he must never give his heart away, again. Recommended to a specific audience - Hot Winter Nights contains a favorite blend for romance readers: an alpha male and a plucky female who is every bit as capable as the guys. I liked the story and I sighed at the ending. Romance readers will love it. I was a little disappointed that it was light on action. I'm not a typical romance reader, so the bedroom scenes honestly just bore me, and there are a lot of them. Fortunately, there are some terrific scenes toward the end -- an exciting concluding scene with plenty of danger, followed by a heartwarming ending. So I closed the book happy. It might not be a favorite because I like more action and less romance but Hot Winter Nights left me satisfied, in the end. 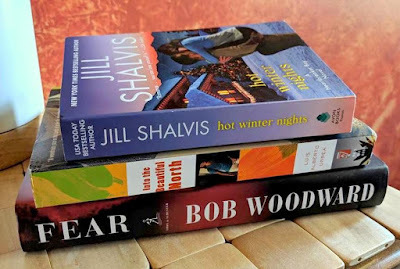 Hot Winter Nights by Jill Shalvis is the 6th book in the Hearbreaker Bay series. I haven't read any of the other books in the series, but it stands alone fine. Back when I was involved in a romance writers group, Jill Shalvis was one of my favorite romance writers for her sense of humor. This particular book was less lighthearted than the Jill Shalvis stories I read back in the 90s but every now and then you get a glimpse of her sense of humor. 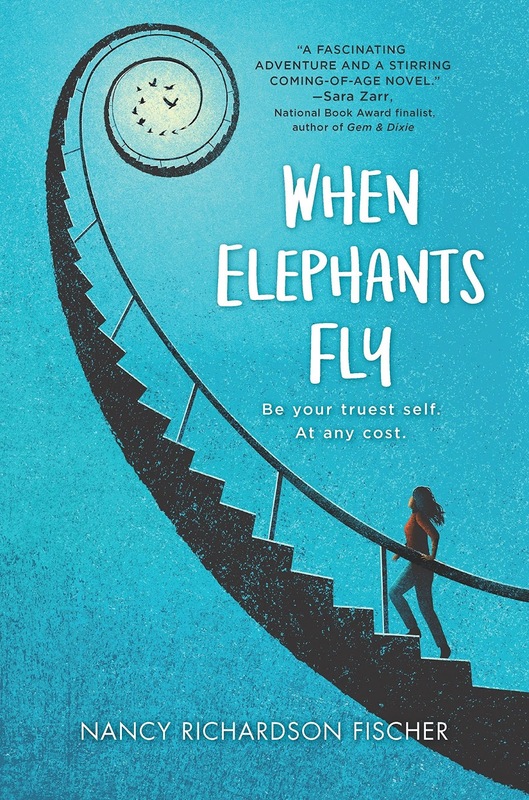 In When Elephants Fly by Nancy Richardson Fischer, Lily Decker has a long-range plan. She's 18 and has entered the age during which people are most likely to be diagnosed with schizophrenia, a disease that has attacked the women in her family for at least 3 generations. Her mother had paranoid schizophrenia and tried to throw Lily off a roof to make her fly. 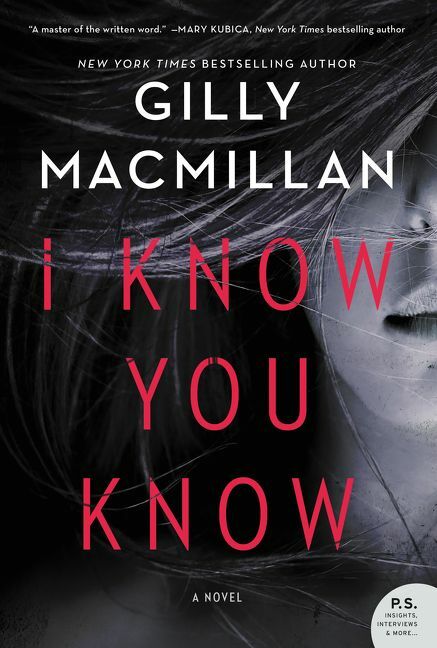 Lily is still haunted by her mother's actions and the way her father watches over her doesn't help. 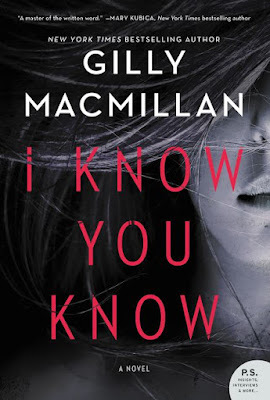 For the next 12 years, Lily plans to keep her life calm, avoid drugs and alcohol, and have her best friend, Sawyer, regularly quiz her to see if she's showing signs of schizophrenia. There's only one problem: life is becoming stressful. After getting an unpaid internship at the local newspaper and coming up with a "name the baby elephant" fundraiser for the zoo, Lily goes to interview the zookeeper. The baby elephant, Swift Jones, is attacked by her mother while Lily's there. Remembering her own mother's attack, Lily steps between the calf and her mother. She's fortunate not to get killed, but the incident and the article that ends up being published will complicate her life. Now not only the calf's life is in danger but her future, as well. Swifty, as Lily begins to call her, is the offspring of a zoo mother and a father who belongs to a privately-owned circus. Lily tries to keep her article about the interview generic to avoid bringing the danger to the attention of the public. But, when her article is substituted for another that tells the unvarnished truth about Swifty being attacked by her mother, the circus insists that Swifty must be flown from the zoo in Oregon to their home in Florida, where she will learn to perform. Lily ends up going along and finds that the conditions are not good. Baby elephants are sensitive and it's hard enough to get Swifty to eat, now that she's been rejected by her mother. But, things get even worse in Florida. Will Lily be able to come up with a plan to save the elephant calf before it's too late? When the stress and fatigue begin to get to Lily and she starts to hear voices, is it just her imagination or is she beginning to have symptoms of schizophrenia? Is there anything she can do to stop it? OK, hmm. I have a lot of thoughts about this book. First of all, I found it utterly compelling because of the idea of what it must be like to live with the fear that you might be hit by a hereditary mental illness. It has a bit of a horror story feel in the vein of Richard Matheson's short stories, where something begins to happen and the horror is in not being able to do anything at all about it. Lily has researched medications and seen the difference between her mother on meds and off -- she knows that medication carries its own risks. And, then there's the elephant's story. The two stories deliberately play off each other: elephant and teenager rejected by their mothers and attacked. But, the themes are kind of different. For Lily, the theme has to do with the importance of living her life, even with a threat hanging over her head. For Swifty, it's more a subject of endangered animals and how quickly elephants are being driven to extinction. I had a few minor problems with the story but I found it engaging and thought-provoking enough to keep me reading. Recommended - When Elephants Fly is moving and heartbreaking, thought-provoking, and meaningful. I really enjoyed the story and I particulary think it would make a great discussion book. My biggest problem with it was a sagging middle, although there were some other elements that bothered me. Of those, the one that nagged at me the most was the idea that a person who didn't work for the zoo would even be allowed anywhere near the elephants, much less be able to get herself into a situation in which she could have been killed or (later) allowed to travel with the zoo staff. I also wondered about the mental illness aspect. Is it likely that a person would suddenly begin to have symptoms of schizophrenia after having a totally normal first 18 years of life or would she have potentially shown some signs earlier? That seemed somehow "off" to me and a psychologist who wrote a review at Goodreads had some interesting but harsh words to say about the book because she didn't think the psychological elements were quite right. Having said all that, I also realize it's fiction and it's YA. Although accuracy is certainly preferable, the story might not work as well if the author hadn't taken a little creative license. Part of what keeps the story moving forward is that question about schizophrenia and the main character: "Will Lily be okay?" 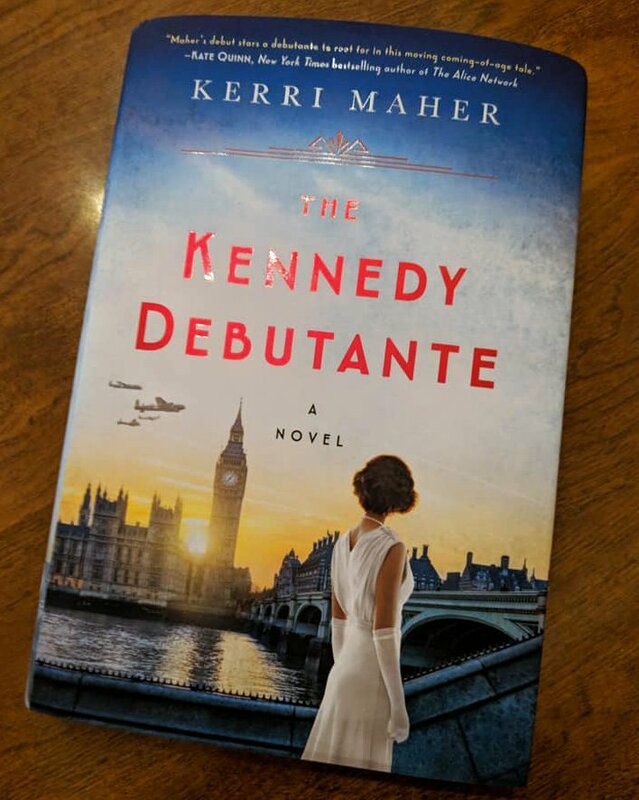 I think it would make an excellent choice for a mother-daughter or young adult book club. When Elephants Fly opens up an opportunity for discussion about both mental illness and the preservation of wildlife on our planet, both excellent topics. I don't have to buy the October selection for my local book group because it's one I already own: News of the World by Paulette Giles. It was a favorite read, a couple years ago, so I'm excited to have an excuse to reread it. The Open Canon selection is one I recall reading about pre-release and I've been interested in it but just hadn't gotten around to tracking down a copy, so I'm also looking forward to that. I'm going to have to read faster, though. I am nowhere near completing this month's list of reads with just a week to go before October. The Birds of Opulence was the first selection of the Open Canon Book Group, Wiley Cash's new online discussion group. Author Crystal Wilkinson did a Q/A on Wednesday evening and it was marvelous. It just occurred to me that I never mention e-books at all, till I read them. That's partly because I don't accept e-books for review, I guess, but mostly because I have trouble thinking of e-books as real books. At any rate, The Sadness of Beautiful Things is a book I was sent by the author in PDF form, a couple weeks ago. I can't bear to read off the computer and it took me 2 or 3 weeks to figure out what my google password is, so that I could enter that password on my iPad (I received it via email) and open the file to read. I finally figured it out by trial and error but I have to reenter my password every time I want to read a story because my iPad likes to close windows and makes me reenter passwords frequently. I think it has some sort of a short it in, somewhere. At any rate, I'm enjoying the stories in The Sadness of Beautiful Things and excited that a new collection of Simon Van Booy's short stories is finally being published. It's been a long time and I always adore Simon's short stories. Sons and Soldiers was one I hoped to finish, this week, but I came nowhere near. It's just a book that's going to take a while, although actually . . . everything is taking a while. I'm just reading it slowly, partly because I'm going through one of those phases during which I need to balance several books to keep myself reading. Hot Winter Nights is a book that arrived and then was immediately and unfairly shoved to the head of the line because I agreed to review it this week. And, A Brown Man in Russia is the travel memoir of a young man of Indian descent (his grandparents still live in India) who had some interesting experiences traveling in Russia, particularly because of his disinterest in learning to read Cyrillic or studying a tiny bit of the Russian language before leaving, although apparently it's a bad idea to slide around on the ice like a kid in Russia. So, there are surprising cultural glimpses. I sit at the kitchen counter and watch Torchwood while I paint. 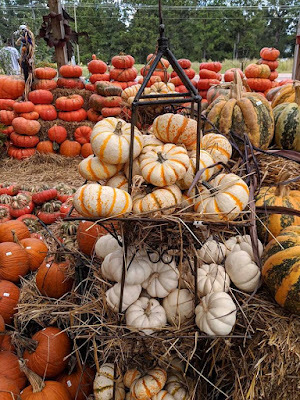 This weekend, we went on a jaunt to our favorite vegetable stand. 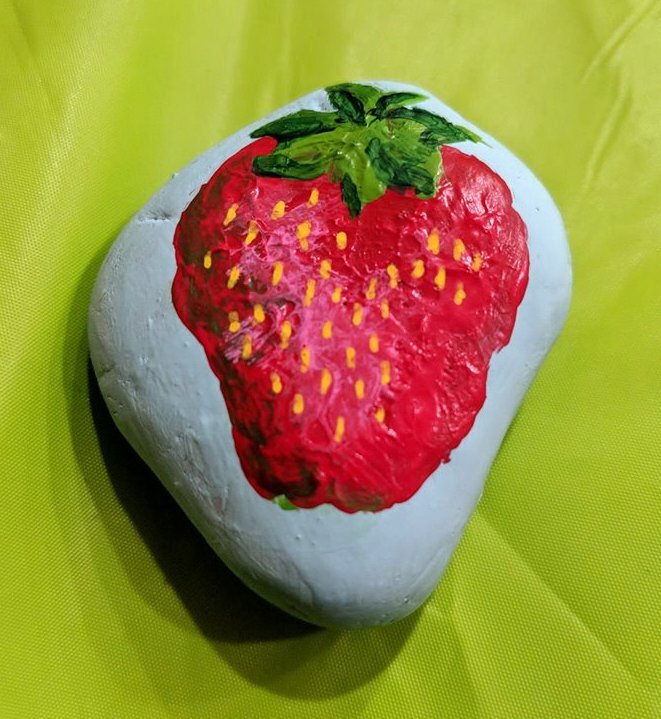 It was so hot that afterwards we drove to the funky Flowood area and had a cold drink at Brent's Drugs, a former drugstore where some scenes from The Help were filmed, and then we walked uphill to the fancy dessert place and got some little cakes. I took a gazillion photos of vegetables at the vegetable stand, with the thought that I'll probably paint some of them. They're all decked out for Halloween. I couldn't help but think half of this will probably be rotten by mid-October if the temperature doesn't cool down. We're still in the upper 80s to lower 90s. 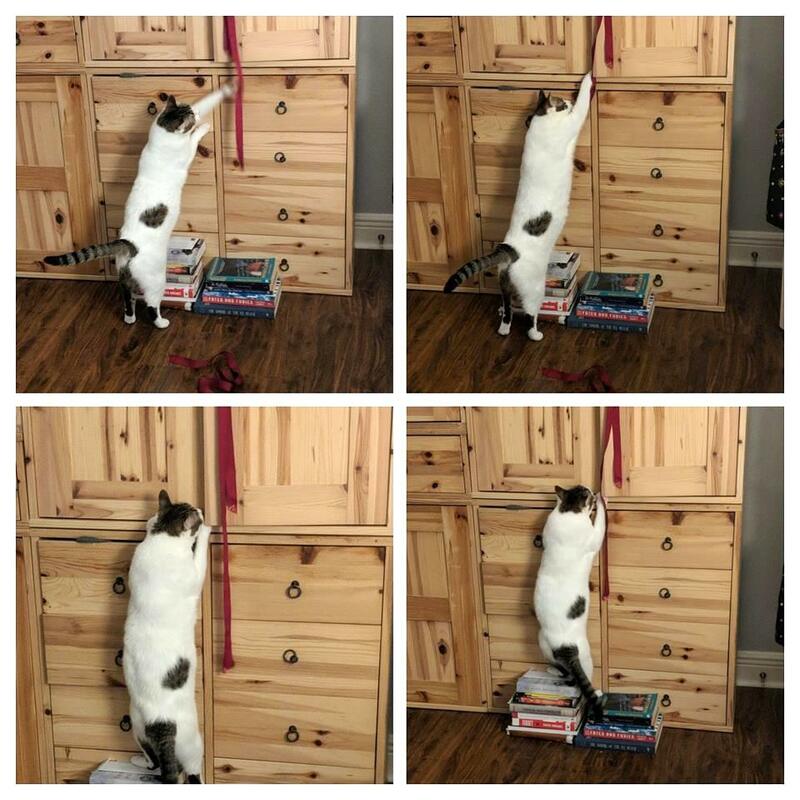 In case you're wondering, Isabel did succeed at pulling down the ribbon. 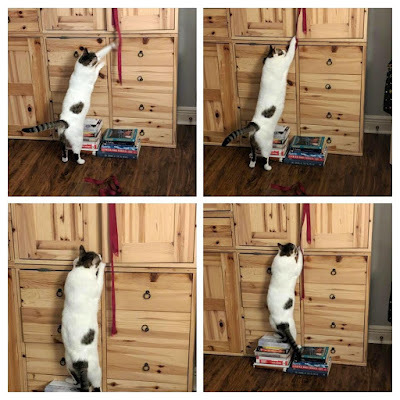 She marched off with her catch (in the third photo, you can see she stopped to check out the contents of the cabinet) and I haven't figured out where she deposited it, yet. Death of the Snake Catcher by Ak Welsapar is a collection of short stories with several different translators. 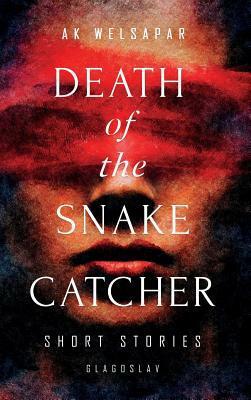 Author Ak Welsapar is originally from Turkmenistan, a country I knew nothing about until I read the introduction of Death of the Snake Catcher and followed that up with a little online reading. It is one of the "most restricted places on the planet", with media that's entirely government controlled and "absymal" human rights (I'm quoting the intro). You get a sense of what it's like to live in such a closed, somewhat terrifying regime from some of the stories, although they're not all set in Turkmenistan. The author, after being declared an "enemy of the people", eventually had no choice but to escape and has lived in Sweden for decades. Some stories felt to me like they could happen on my home turf, with perhaps a few minor alterations, and some were a little too foreign for me. At least one made very little sense to me because the traditions and expressions were a little too far from my own understanding. But, the book was worth reading for the few that really made an impact and the introduction left an indelible impression on me, as did my favorite story. "On the Emerald Shore" - A mist envelops the sea and the locals believe it to be the work of the drowned. Several people have recently drowned in the area. One is missing and presumed dead, another has washed ashore. In the nearby bar, people play billiards and discuss the drownings, wondering about how they may have occurred, especially to the most recent victim, who was muscular and fit. "Love in Lilac" - My personal favorite, the story of a young man named Arslan who spots a "beautiful, fair-skinned girl" sitting amongst the lilacs in a Moscow park. He approaches her awkwardly and eventually they fall in love. But, it's forbidden to interact with foreigners and she's a student from Sweden. After falling for her hard, he is one day removed from class. He was picked up by the KGB with a sickening lack of ceremony. What follows is one of the most intense sections of a short story that I recall reading since the days when I used to read a lot of Richard Matheson's short stories. I don't want to give it away, but it is an understated sort of menacing experience in which the tension ramps up because of what doesn't happen but could -- and Arslan knows it. I've recently seen comments that some Americans are unconcerned about the possibility that we could become an authoritarian regime. This story should make anyone who made such casual remarks have second thoughts. "One of the Seven is a Scoundrel" - Another menacing story (the tense stories were my absolute favorites). Seven men are returning home in a horse cart from a hard day's work harvesting and talking about how some nearby villagers have been sent to Siberia when their path intersects with that of some soldiers. The soldiers have a quota of men to take to prison but one has escaped, so they need one more. Who will end up being taken away, not for doing anything wrong but to fill a quota? Who will be the scoundrel who turns him in? Recommended - The title story, "Death of the Snakecatcher" is another favorite. I recommend Death of the Snakecatcher particularly to short story lovers and people who enjoy reading translations. While there were times I felt like I needed some sort of explanation -- a glossary, an introduction to a particular story, etc., to make sense of specific traditions -- the stories that I liked best were so thought-provoking that I had to put the book down to let a story roll around in my head for a day or two. That has always been the sign of a phenomenal short story to me, not being able to get it out of my head until I've given it some thought or wanting to talk to everyone about it. On the third day, a mist enveloped the sea. Albescent, rising up off the water, it languidly wrapped around the shore, then the town, little by little covering the entire surroundings. The sweltering summer heat seemed intolerable to the men lying on the horse cart moving along the dried mud takyr path, some holding their coats and some their sheepskin hats under their elbows. ~from "One of the Seven is a Scoundrel"
Only one book! I'm improving at the self-control thing. My mailbox is sad, but I'm okay with it. I had mixed feelings about When Elephants Fly, a YA about a young woman whose paranoid schizophrenic mother once tried to throw her off a rooftop and who is now involved in trying to save the life of a newborn elephant. So, I wrote my immediate thoughts at Goodreads and put them behind a spoiler barricade, just in case I'd given anything away. I'm not sure if I did, but I'll have to think about how to write about it carefully, here. Mac B., Kid Spy: Mac Undercover is goofy fun for middle grade readers. I loved it. It's the first in a series and I wish the publisher had sent #2 along. I'm still only about 1/3 into Sons and Soldiers but I hope to focus on finishing that, this week. The Birds of Opulence is the September selection for author Wiley Cash's new online book group. I can't recall the name of the book group but you can find out about it by going to Wiley's website or following him on Facebook, if you're interested. So far, the book is excellent. So is Sons and Soldiers. It's just one of those nonfiction titles that's taking me longer to read because I need breaks from it. Even when it isn't stated, you know many of the family members left behind in Germany by the Jewish boys who escaped must have been killed, so it's emotionally exhausting. But, it's also very well written and yet another perspective on WWII that I've never read about, so I'm enjoying the learning process, even if I find the story somewhat painful. Not a big week because I was tired after having visitors (and I missed them after they left). No shiny new things to report. No movies, just a little of the same old things we've been gradually watching. We're on Season 2 of 800 Words and Torchwood, Season 4 of Doc Martin, I think. How was your week?
. . . 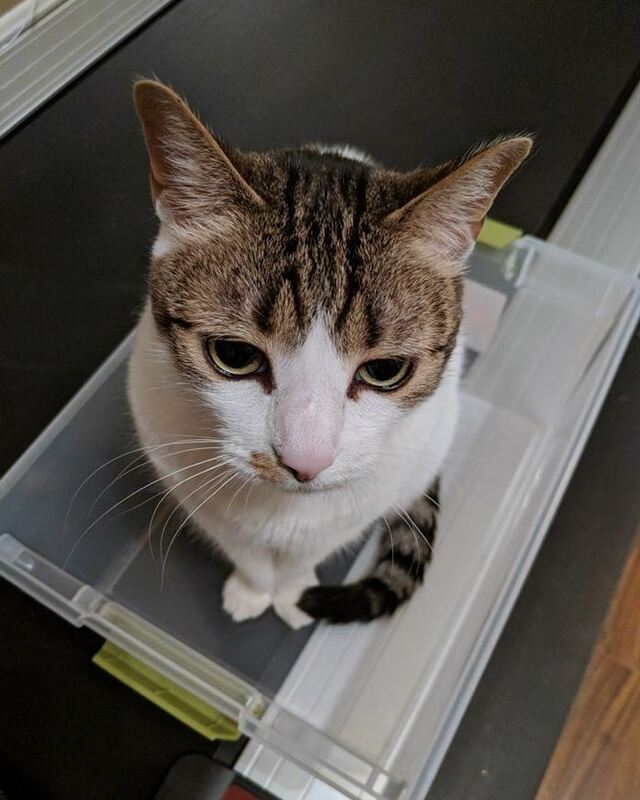 I sits. In Saving Winslow, Louie loves animals but he hasn't had the best of luck keeping them alive. Now, his father has brought home a premature newborn miniature donkey. He's brought the donkey home to keep it comfortable till it dies. But, Louie is determined to make sure the donkey survives. Louie names the donkey Winslow and then sets to work feeding him, keeping him warm, and letting him know he's safe. Louie won't let anyone around him say anything negative about Winslow's chances. As Winslow grows bigger and stronger, his chances also grow. But, he's still fragile. Louie was born prematurely, himself, so he knows a tiny newborn can survive. Will Louie be able to keep little Winslow alive long enough to get past the dangerous newborn stage? Highly recommended - I love Sharon Creech's writing but Saving Winslow is something special. I love the way Creech connects Winslow's premature birth to Louie's, the way Louie keeps faith in spite of relentless negativity (everyone wants Louie to be prepared, in case Winslow dies), and the way Louie's confidence begins to rub off on everyone around him until even the biggest skeptics want a part in help caring for Winslow. 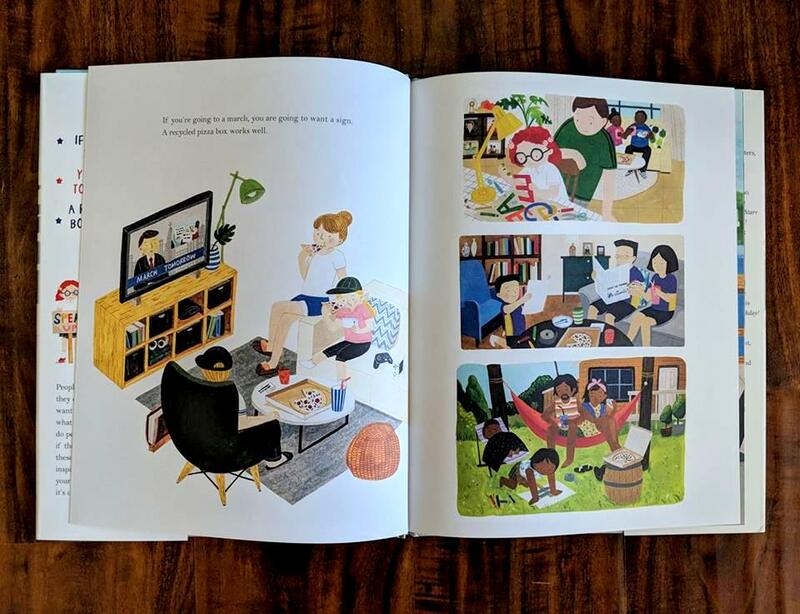 There is one neighbor who can't bear Winslow's squawking but eventually an event occurs that brings the neighbors together and enables them to understand each other. There's also a sweet friendship with a little girl and tender affection for Louie's big brother, who is in the military and sorely missed. A lovely, touching, uplifting story for middle-grade elementary readers. 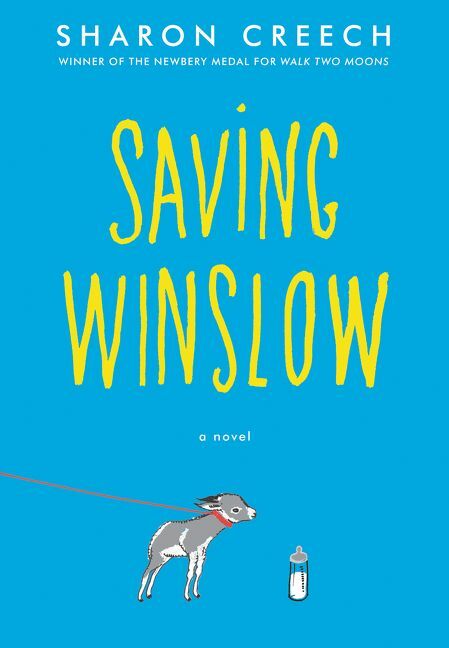 Saving Winslow is scheduled for release on September 18, 2018. At least one of these kitties is sad about the fact that our granddaughter just left for the airport. The other is probably happy to emerge from her hiding space, after several days (Isabel). Fiona was captivated by our little munchkin and followed her everywhere. No books arrived, this week. Not one. So, no "recent arrivals" column. I decided I'd waited too long between readings, so I restarted Sons and Soldiers and am around 94 pages in. Enjoying it just as much as I did the first time I started it and I'm looking forward to some quiet reading time, after a few days of chaos and very little reading. When Elephants Fly is YA about an 18-year-old whose family has a history of schizophrenia. 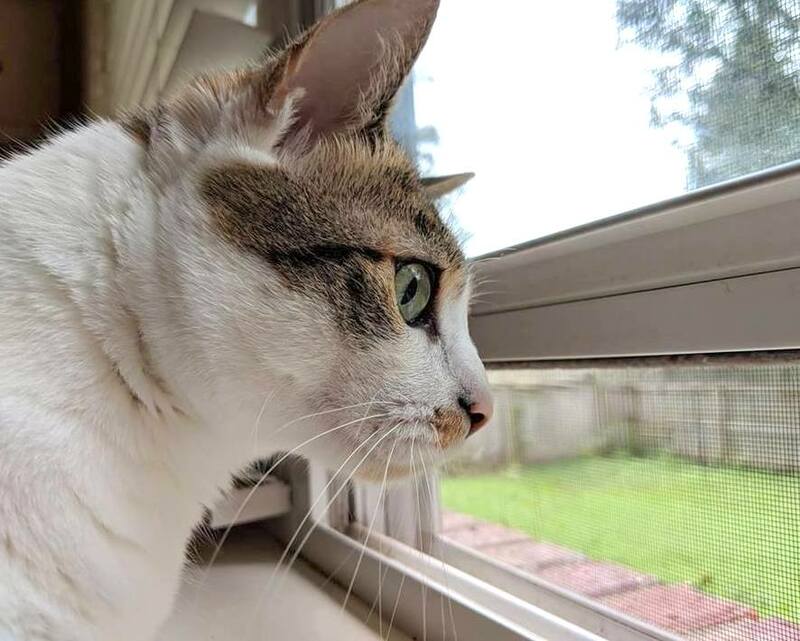 Lily's working on keeping her life calm, trying to avoid becoming schizophrenic, as well. But, as an intern at the local newspaper, she's become involved in events at the local zoo. A baby elephant has been born and been rejected by her mother, who tried to kill her. Lily can relate because her mentally ill mother tried to throw her off a roof (thinking she would fly). What will happen to baby elephant Swift Jones? Can Lily stay calm and sane until the 12-year time period in which diagnosis is most likely to occur ends? Last week was Children's Week, so all of the reviews were reviews of children's picture books. I had all my posting finished by the time our visitors arrived and they got to indulge in a pile of freshly reviewed books at bedtime. I didn't ask about all of the titles they read but I found out I was correct in predicting that How to Feed Your Parents would be a giggle-inducing hit. 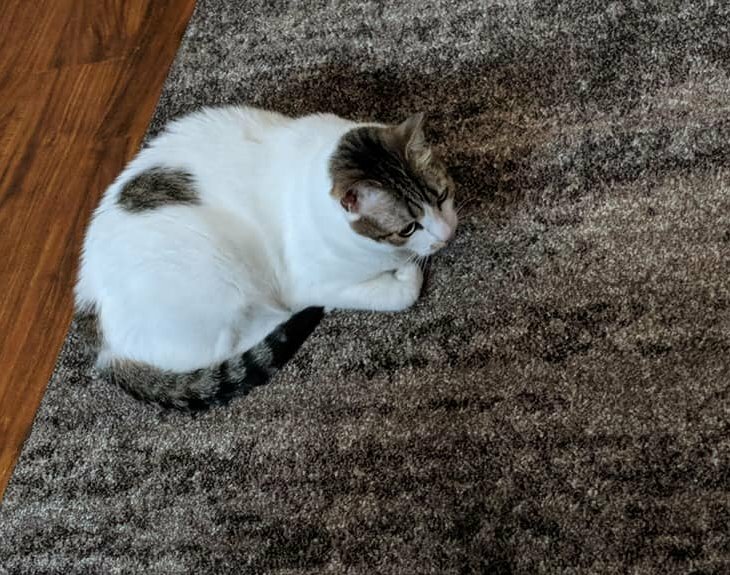 New guest room rug is Izzy and Fiona Approved. They refused to even try anything else. Matilda Macaroni, the child in How to Feed Your Parents, likes a variety of foods and she wants to try quiche, but her parents are not interested. In fact, they're extremely picky. They only eat chicken nuggets, elbow macaroni mixed with orange powder, burgers from kids' meals, grilled cheese sandwiches, pepperoni pizza, and sugary cereal that turns the milk a different color. You can see where this is going. Author Ryan Miller has turned the concept of the picky eater on its head. Instead of the child being a picky eater, it's the parents who eat a limited range of foods and refuse to try anything new. Matilda discovered her love of other foods when Grandma Macaroni brought over a pot of jambalaya. "Yuck!" Matilda's dad said when he saw the pot. "No way!" Matilda's mom said when she smelled the steam. They pushed their plates to the center of the table and sulked. Matilda began to try more new foods: gumbo, goulash, sushi, pork paprikash. She had to learn to cook for herself, since her parents kept their menu strictly limited. She learned to crack eggs, first. Then, she learned oven and knife safety and read cookbooks at bedtime. She bought ingredients at the farmer's market. But, how would she convince her parents to try the new things she'd learned to cook? Matilda convinces her parents to let them cook burgers. Then, she tells them they can eat what she's cooked or go hungry. Her parents are grossed out by the mushrooms and green stuff, but they're also impressed that Matilda cooked, so they agree to try their burgers and decide they're not so bad. Maybe Matilda can cook quiche, next? Instead, her parents ask if they can help with the cooking. 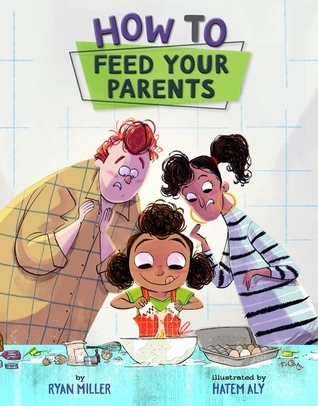 Highly recommended - I love a story in which a concept is reversed and How to Feed Your Parents is perfect -- a child convincing her picky parents to eat new things. I'm certain it will get a few giggles, at first, and then become a favorite of many children. Mine would have loved it at picture book age and I think it's a hoot. The illustrations are great; the artist did a tremendous job of showing the horror on the faces of Matilda's parents when there's something they don't want to try and the excitement when they realized food is not such a horrible thing, after all. A delightful read and a new favorite. This is my final entry for Children's Week. I've decided to save the books for older children and start working on reviewing those, mixed in with books for adults, next week. The Day You Begin is about being different, whether that means looking different, sounding different, or any other characteristic that leaves a child feeling alone in his or her uniqueness. It's about sensing that you're out of place, knowing that in the room you walked into or the classroom you're always in, something sets you apart. Maybe everyone in class went somewhere during summer vacation but you. Maybe you're the only person in your class who brings a packed lunch or whose lunch is unfamiliar to everyone else. Maybe you're not athletic and you're the last to be chosen for team sports. 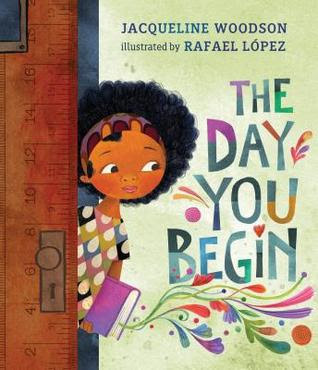 In beautiful, gentle prose, author Jacqueline Woodson talks about being set apart but learning to embrace and share your own story, whatever that may be. And, the thought that maybe when you tell your story you will find something in common with someone else in the room. Highly recommended - A new favorite. I love everything about The Day You Begin. Beautiful prose, stunning illustrations, and a subject that absolutely everyone can relate to. It's a great way to get a head start explaining that there will be times a child feels totally out of place. Even now, I can relate to the subject matter in The Day You Begin and recall times in school that I felt like I was the odd duck in a room full of swans. Highly recommended for any and all children and libraries. "Surely you've noticed a chill in the air,"
said Pancake, "I'm freezing! There's frost in my hair!" Something has gone wrong in the fridge. Instead of chilling things to the usual temperature, everything is getting frosty and frozen, like the fridge temperature has been turned to freezer level. What's going on? 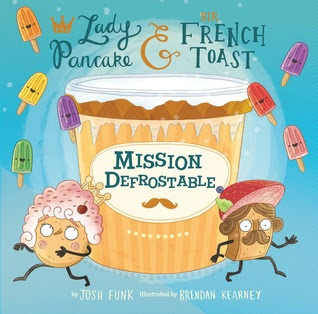 Lady Pancake and Sir French Toast are mulling the problem when a detective (who also happens to be a spear of asparagus) shows up. They head toward the freezer to figure out the problem, but then the detective suddenly disappears. 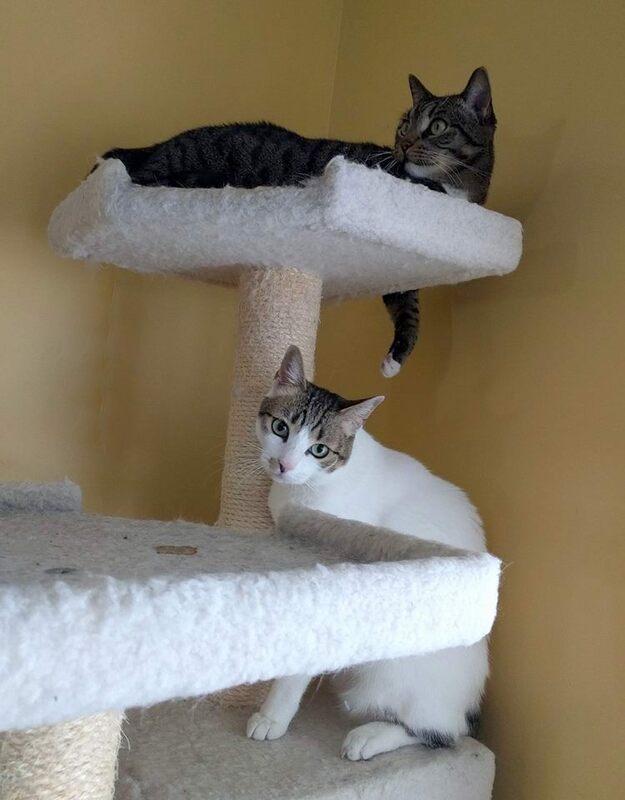 Lady Pancake and Sir French Toast need help. So, they turn to their rival, Baron von Waffle. Waffle knows the freezer well and can keep them from becoming lost. The trio makes its way to the heart of the freezer, but Pancake and French Toast are seized by a bunch of popsicles and shackled with curly fry chains. They're taken to see the empress, who tells them her story of horror and revenge. But, then Baron von Waffle swoops in to save the day. The empress is impressed by the touching scene of friendship and agrees to unfreeze the fridge. All return to the fridge, heroes who have saved the day. Highly recommended - I love this entire series. It's cute, silly, adventurous, and I love, love, love the illustrations, in which fridge and freezer contents are made to look like landscapes. 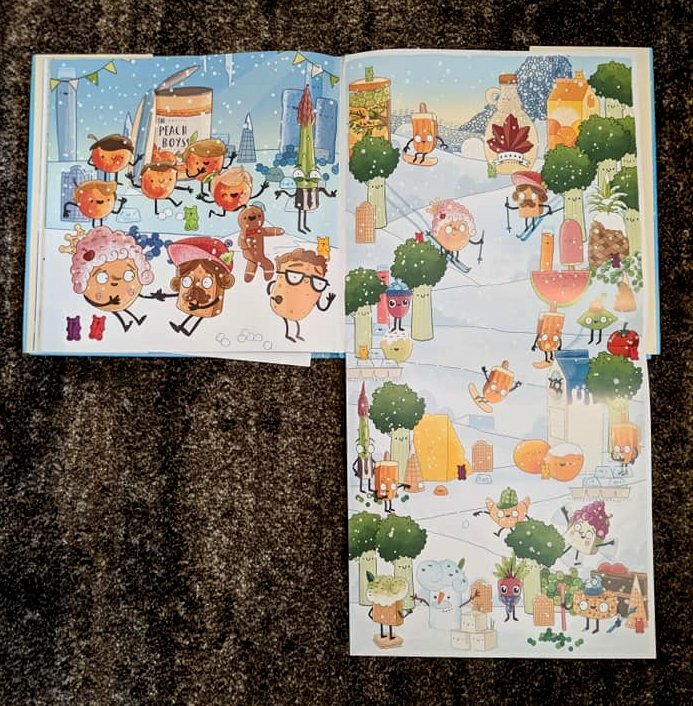 There's always a fold-out illustration, as well, so careful to save this one for children who are past the page-tearing stage (click on image to enlarge). I've read several of Jim Arnosky's and they never fail to take my breath away. In Look at Me! Wild Animal Show-Offs, Arnosky takes on the concept of displaying: spreading skin, making noise, inflating body parts, growing large antlers, showing plumage, using color. All are described and shown in Arnosky's typical, vivid paintings with the occasional series of sketches. There are regular spreads and fold-outs that are so magnificent it's best to just show one. I had a close-up of the left-hand part of that image but Blogger is having a fit and refusing to let me load it. You should be able to click on the image to enlarge. Highly recommended - Informative and jawdroppingly gorgeous. I love Jim Arnosky's nature books but I think Look at Me! may have just become my all-time favorite, although they all end up on my favorites list. 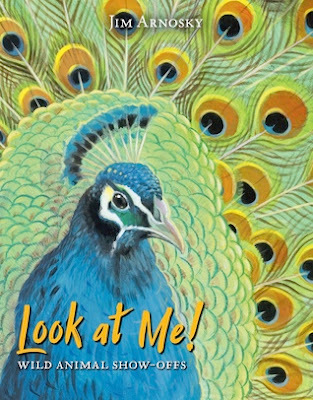 I am crazy about Jim Arnosky's eye-popping illustrations and highly recommend any or all of his nature books for home or library. It was apparent from the moment the piglets arrived. Jasper was an unusual pig. He hated playing in the mud. the way the other pigs did. Jasper was loved but he felt out of place. So, the volunteers at the sanctuary where Jasper lived created a place of his own where he could help with the bookkeeping. He held meetings and tried to show his flow charts to the chickens (they weren't interested). The goat ate his business card and nobody was interested in adopting him, no matter how many charts he offered or resumés he handed out. But, Jasper had a great attitude and formulated a plan. He came up with all sorts of clever ways to advertise his availability for adoption. Luckily, upper management was also impressed with Jasper's credentials. "Upper management" is the little girl's mom. And, with the making of an offer and signing of a contract, it was a done deal. Jasper had a home. Recommended - A cute, clever book about being different but working with your uniqueness to find a way to your goal. 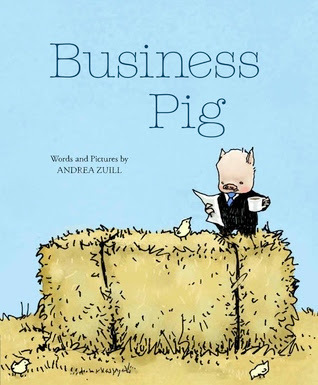 Business Pig is the third book I've read that's both written and illustrated by Andrea Zuill. I was surprised at how very different the illustrations were, in this one. The first two I read were both color on a pure white background. Business Pig is full color, with bright barns and fencing, brown dirt, greenery, a beautiful blue sky. It just works. The little girl who adopts Jasper has the same quirky business-like look. She wears a salmon suit, carries a briefcase, and wears glasses. Nice way to show that you may be quirky but that doesn't mean you're alone. When Allie's crayon breaks, she is so angry that she behaves monstrously. 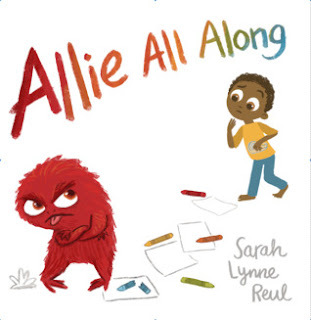 In Allie All Along, she's shown as a big red metaphorical monster. Her brother has ideas to help her get over her tantrum, though. First, he gives her a pillow to punch. It helps a bit. The red monster becomes a yellow one, showing that she's a little less angry. He gives Allie her favorite toy to squeeze and that helps a little, too. Now, she's just a green monster. Step by step, Allie's temper dims as her brother uses calming techniques on her. She becomes less angry until she's just slightly upset and a little sad. And, then a hug is enough to help her forget her anger completely. The monster is gone and it's just Allie showing, now. Recommended - I'm so far beyond the days of having a small child that I had to think back to remember temper tantrums and then I recalled one doozy that happened while my eldest son and I were shopping. There wasn't a pillow to punch or a toy to squeeze. There won't always be, of course. But, talking about temper tantrums and reading about ideas to manage a little one's anger when they're not angry, or reading to help them calm down, seems like an awfully good idea to me. Even adults don't always understand their own emotions and Allie All Along tells a child, "You're okay. Even when you're unhappy and become a bit of a monster, the real you is in there, just trying to figure out how to cope." And, maybe it will give a few parents ideas for dealing with tantrums. If you're going to a march, you are going to want a sign. A recycled pizza box works well. The author continues with other advice. Check the weather so you'll know to dress appropriately and bring an umbrella or sunscreen. Wear sturdy, comfy shoes, and carry as little as you can, but bring water and snacks. Be prepared for a long walk (take public transport, if possible). There will be speeches. This part might be boring, the book warns. I admit that made me laugh. The author mentions that there may be music and it's fine to have fun dancing. But, then comes the march. You'll need to double-knot your shoes so you don't trip, be careful not to get lost but know your address and phone number, ask someone to hold your sign if you have to go to the restroom (with an illustration showing porta-potties). You should know that police officers are there to keep people safe and reporters might ask you questions. You might end up chanting with other marchers. All great advice and nicely laid out. Highly recommended - I was going to recommend this book for a particular audience (kids who plan to go on a march) but it occurred to me that not everyone will end up going to a march but some children may be curious what's involved when they see video footage of people marching on TV. So, I'm not going to keep the recommendation as narrow as I originally intended. 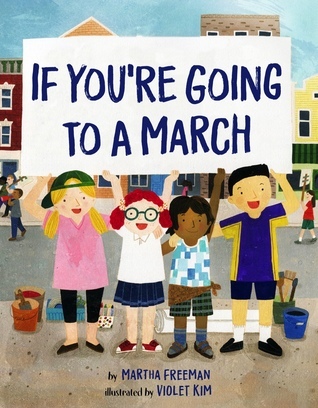 Instead, I will say that I think If You're Going to a March offers excellent advice and is a particularly interesting new children's title because it's unique. 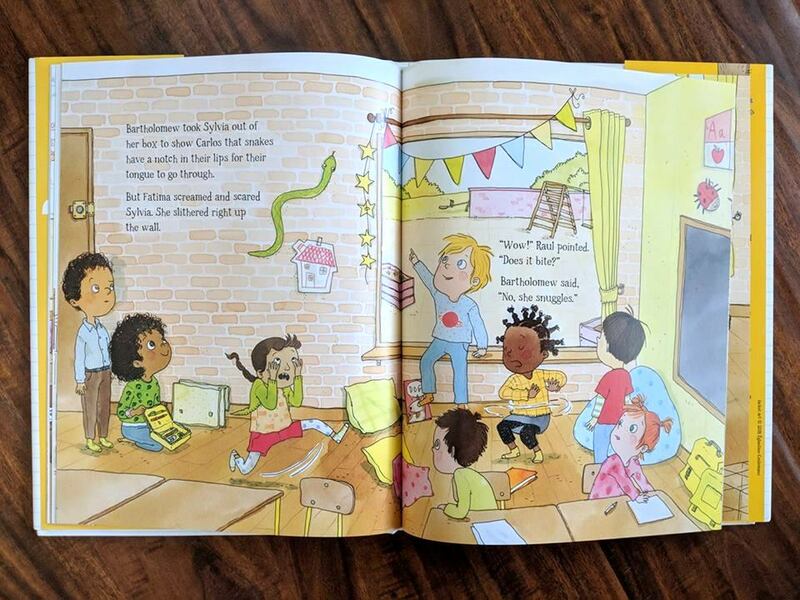 I've never seen a book about participating in a march, before, although protests have been around for ages and certainly there have been children who participated, in the past. While the illustrations are not done in a favorite style, I found the detail nicely done and the steps to preparing for a march and being in one clearly illustrated so that even a non-reader who might end up on a parent's shoulders or riding in a wagon rather than marching and making a sign can get a great idea of what he or she is about to experience. There's an afterword in which the author talks about the importance of "we the people" telling the government what we want, through voting, running for office, marching and/or protesting. Past reasons for protests are mentioned and the words are ringed by illustrations showing reasons people have marched in the past, which gives the book a nice, well-rounded feel. If You're Going to a March is #3 for Children's Week. If I have time, I'll write one more review, today. If not, Children's Week will continue tomorrow. all so much that he couldn't go to school without one. So begins No Frogs in School. A frog named Ferdinand is the first pet Bartholomew takes to school. Ferdinand goes to school in Bartholomew's lunchbox and makes an unexpected appearance when the class is talking about mixing colors. He jumps right into fellow classmate Lacey's finger paints. The teacher, Mr. Patanoose, is not happy. He creates a rule: No frogs in school. The next day, Bartholomew brings a salamander to school. More trouble ensues. Sigfried the Salamander runs up a student's sleeve and hangs from the teacher's shoe. Mr. Patanoose comes up with another new rule. No frogs, toads, or tadpoles; nothing born on the water but living on land as an adult (amphibian) is allowed in the classroom. You can see where this is going. Bartholomew is smart enough to know his amphibians from his mammals and reptiles. He keeps bringing new pets -- and chaos -- until Mr. Patanoose declares all pets owned by Bartholomew off-limits for school, including show and tell. But, then Bartholomew has an idea. He brings Rivka the rabbit to school, but offers up Rivka as the classroom pet. Now, he can see an animal at school every day and so can everyone else. 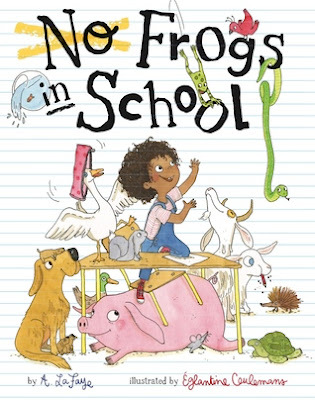 No Frogs in School is also an excellent introduction to what it's like inside the classroom for children who are on the verge of attending school and a great laugh for animal lovers. No Frogs in School is Book #2 for Children's Week at Bookfoolery. More to come. 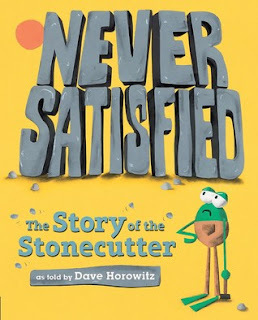 Never Satisfied: The Story of the Stonecutter is a circular tale about a stonecutter who wishes to be something else. Cutting stone is not an easy way to make a living. One day, on his way back from the rock quarry, Stanley noticed a businessman just sipping tea. "Hmmf," said Stanley. "That must be nice. I wish I were a businessman." And, with that, Stanley is suddenly transformed into a businessman. But, he doesn't stay satisfied for long. He looks out the window and sees the king passing by. The king doesn't even have to walk. He's being carried down the road in a sedan chair. Stanley wishes he were the king. Again, his wish comes true and he is instantly transformed into the king. But, then the sun beats down on his head and Stanley realizes that everyone must look up to the sun. Stanley goes from being a stonecutter to a businessman, businessman to king, king to the sun, sun to a black cloud that blocks the sun, black cloud to the wind that pushes clouds away, and then . . . he finds that the one thing he can't budge as the wind is a great stone. Stanley wishes to be the stone because surely nothing could be greater. And, then along comes a stonecutter. At the end of the book, Stanley realizes that he was meant to be a stonecutter all along. But, that's left unsaid. It's clear Stanley is going to wish to be what he was in the first place. 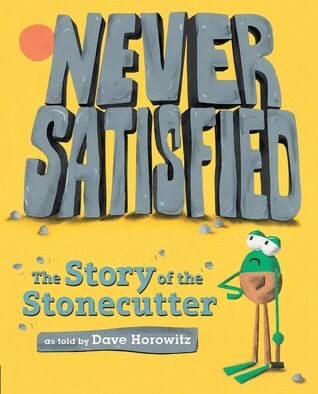 Highly recommended - Never Satisfied is book worth talking about with a lesson every child needs to learn. At Goodreads, there are only two of us who gave Never Satisfied 5 stars, which I confess surprised me. 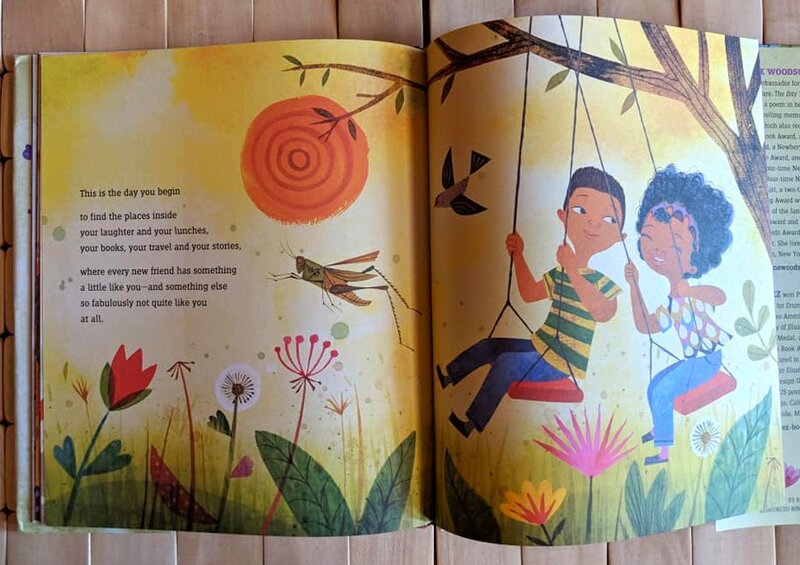 I think it's a lovely tale with a "grass is greener on the other side" theme that opens up a terrific opportunity to talk about being happy with what you have. Love the bold but simple illustrations, as well. There's an author's note at the beginning of the book that is of unusual interest. Dave Horowitz had a dozen books published before his frustration with the difficulty of the job led him to change fields. He became a paramedic and it was another paramedic who told him the story of the stonecutter. Clearly, he learned the lesson of the stonecutter. I love it that this particular tale is one that the author learned from and that he returned to writing and illustrating books as a result. I'm curious whether or not he's remained a paramedic, as well. I can't think of many jobs that are harder than emergency medical care, so I was doubly surprised at the direction the author went when he changed jobs. Never Satisfied is Book #1 for Children's Week. 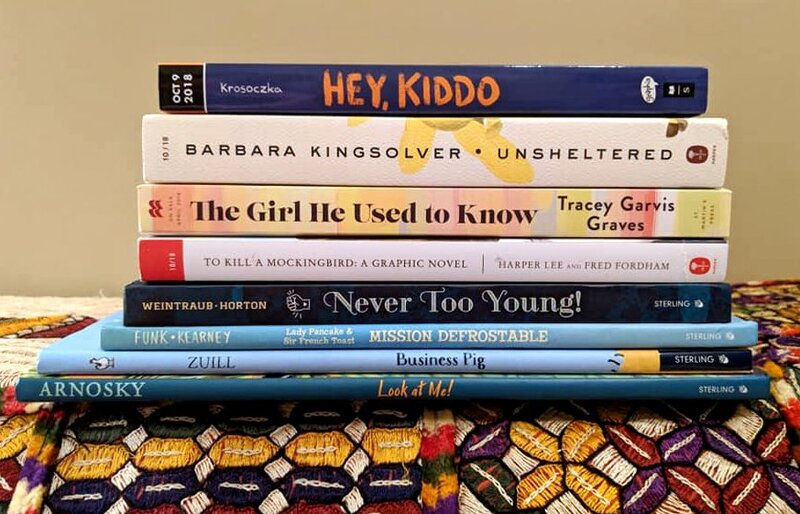 I'm dedicating this week to reviewing children's books because I have quite a substantial stack to review. There should be several reviews per day. It just depends upon how much time I have, how many I manage to crank out. Recent arrivals are going to be divided into purchases and books from publishers, today, since quite a few walked in my door, in the past two weeks. 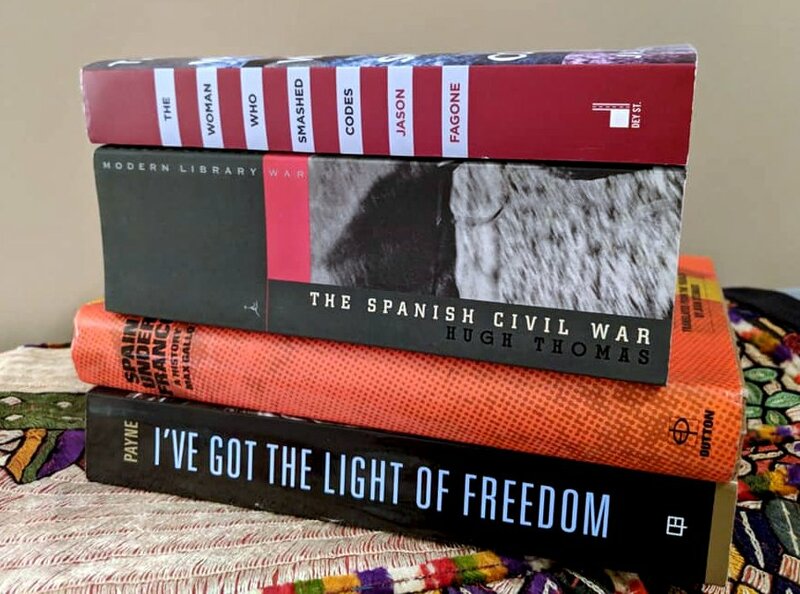 In order: WWII, The Spanish Civil War (twice), and Civil Rights in Mississippi. I think I'll save the Civil Rights book for Black History Month. 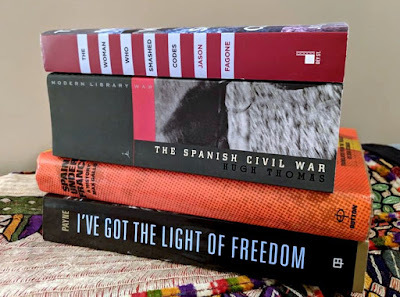 And, there's no way I'll get to the rest before 2019 but I did make an interesting discovery, thanks to the arrival of that fat book on the Spanish Civil War. I am no longer terrified of chunksters. In fact, I can hardly bear not diving into that huge book! I can't even tell you how happy that makes me. But it'll have to wait. I have at least two more very full months in which I've got a stack already waiting for me. I'm going to do my best to avoid requesting anything but children's books, for the next few months, so that my calendar is freed up for books I already own, come the first of the year. Am I a lucky girl, or what? Such an exciting pile. Of course, I've already read some of the children's books. Middle-of-the-night reading story forthcoming. They were worth the excitement. 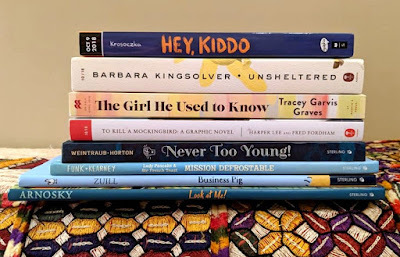 I read a ton of children's books in August, about 2/3 of the books I read. So, I did something a little different when the latest pile walked in the door. Instead of immediately sitting down to read the four children's books the moment they arrived, I waited until August ended so that I'd have a swinging start to the month of September. As it turned out, I went to bed early on the 31st and woke up at 1:30 AM. Sproing! I was wide awake. So, I sat up and read three children's books (and started a 4th) at 1:30 in the morning. They made the time a little more joyful than it might have been. Why toss and turn when you can read about a pancake and a piece of french toast saving the day with the help of a former rival? This week will be dedicated to reviews of children's books. If I finish reviewing the picture books, I'll move on to middle grade titles. If not, I'll save those for next week. I also still have a bookmark in Sons and Soldiers by Bruce Henderson and plan to focus on that title after I finish I Know You Know. Husband says it's the remake of another movie similarly titled. 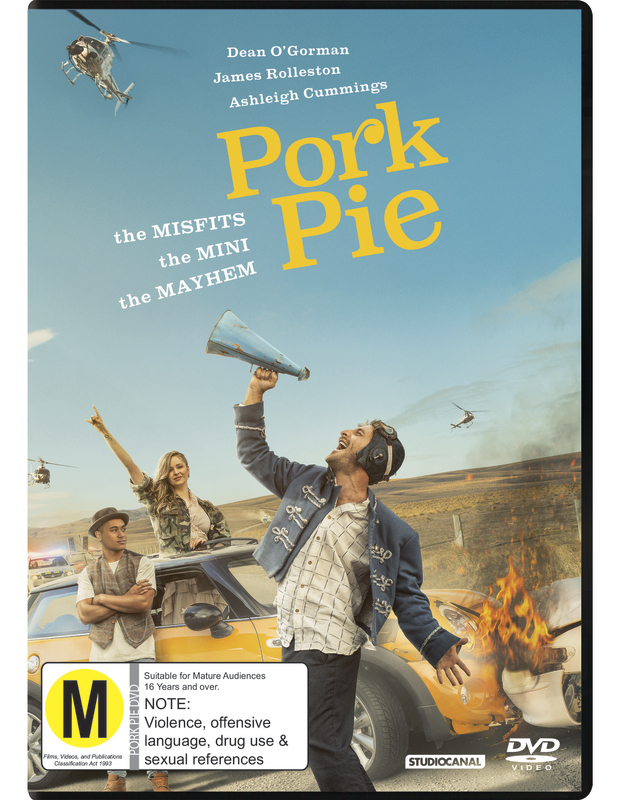 Pork Pie is the story of three people who unexpectedly become outlaws and end up getting chased across New Zealand by both police and reporters. It's a fun movie, filled with exciting chase scenes. The characters are nicely wacky and slowly become friends (actually, two of them become . 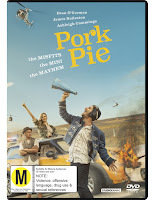 . . more than a little friendly) on their way to Invercargill, where one of the men wants to apologize to someone for the horrible thing he did, which he now knows to have been the biggest mistake of his life. Loved it! Still watching Torchwood, when I have an hour to sit and goof off. My absolute favorite episode was in Season 1: "Random Shoes". Since the year I binge-watched Torchwood, I've occasionally gone back to watch "Random Shoes". It's an unusually sweet and touching episode and I was excited when I discovered it was next in line. I did skip over one episode that I remember as particularly gruesome. No need to watch anything that I didn't like the first time.